VANCOUVER, Jan. 17, 2019 /CNW/ - Hannan Metals Limited ("Hannan" or the "Company") (TSXV: HAN) (OTCPK: HANNF) is pleased to announce it has submitted mineral claim applications covering 14,800 hectares in north-central Peru to secure an unexplored and widespread district covering 15 kilometres strike of copper-silver occurrences. The new San Martin project area application is 100% owned by Hannan, and is located about 30 kilometres northwest of Tarapoto, in the Cordillera Ayu Mayo (Figure 1). Project access is excellent via a proximal paved highway, while the altitude varies between 800 metres to 1,600 metres in a region of high rainfall and predominantly forest cover. Peru is the world's second largest copper producer. Sediment-hosted deposits are the second most important source of copper globally, accounting for approximately 20% world production. 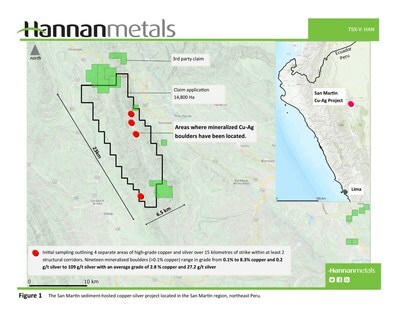 Michael Hudson, Chairman and CEO states, "The San Martin copper-silver project is an early stage project, but already demonstrates many of the features needed to consider it a tremendous discovery opportunity for Hannan. The eastern margin of the Peruvian Cordillera has seen very little previous exploration, and to collect undocumented high-grade copper-silver samples over a 15 kilometres strike is a rare and exciting experience. The project has the hallmarks of forming a significant new sediment-hosted copper-silver district, with high-grades of up to 8.3% copper and 109 g/t silver from an intra-continental salt bearing sandstone sequence. 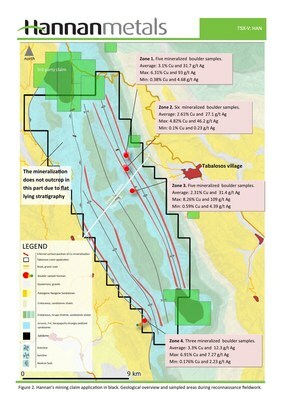 We look forward to commencing the first systematic exploration ever completed in the area over the coming months". As was announced on 24 December, 2018, Hannan conducted initial field work at the San Martin project during late 2018 when riverbeds and creeks were prospected. Only a small proportion of the claims were accessible owing to seasonal rains, however four separate areas of high-grade mineralized copper-silver boulders were discovered over a 15 kilometre strike, across multiple structures. 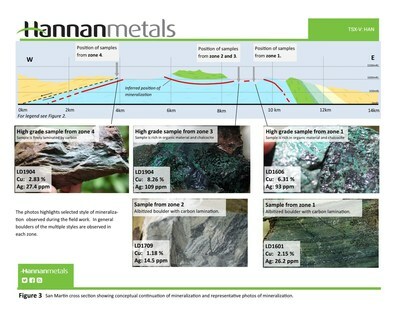 Grab samples taken from boulders within creeks which drain outcrop returned values ranging from 0.1 to 8.3% copper and 0.2 to 109 g/t silver with an average grade of 2.8% copper and 27.2 g/t Ag (Table 1 and Figure 1-3) over 15 kilometres of strike across two structural corridors, highlighting the potential for discovery of a strike extensive near-surface, sediment-hosted copper deposit. Grab samples are selected samples and not necessarily representative of the mineralization hosted on the property. Mineral claim applications have been filed for a 14,800-hectare area. At this time the claim applications are in process and have not been granted. Hannan had a community liaison team on the ground before sampling took place and looks forward to working closely with all the communities in the area. Field work will recommence during Q1 2019, with the aim to extend the mineralized trend. Mineralized widths remain unknown and will be the focus of upcoming work programs. Copper and silver mineralization is hosted by the 150 Ma Saraquillo Formation, which was deposited in an intra-continental basin during the Jurassic-Early Cretaceous period. The Saraquillo Formation is 1.2-1.8 kilometres thick and extends for over 1000 kilometres of strike. The Saraquillo is associated with salt domes which suggest widespread evaporitic strata, with several small artisanal salt mines present in the area. The Cordillera Ayu Mayo is comprised of two parallel anticlines striking north-northeast and flanked by east and west dipping thrusts. Dips vary from 0 to 35 degrees and steepen immediately adjacent to thrust faults. Mineralization is associated with the contact of fine-grained reduced carbonaceous sandstones with highly oxidized red beds of the Saraquillo Formation. Mineralization consists of disseminated chalcocite, covellite, bornite and digenite with minor fine pyrite. Chalcocite is the dominant copper sulphide and it is always found together with carbonaceous material. Chalcocite occurs as fine disseminations, fracture filling and centimetre-sized massive aggregates. Secondary copper minerals are common on exposed surfaces. Albitization and silicification is associated with the mineralization, where the former dominates in more strongly mineralized samples. The geological setting of a closed basin, extensive development of evaporites, and major structures fits well with a sediment-hosted copper-silver deposit model (Figure 4). The company has collected a wide suite of samples for petrographic studies and the results are awaited. 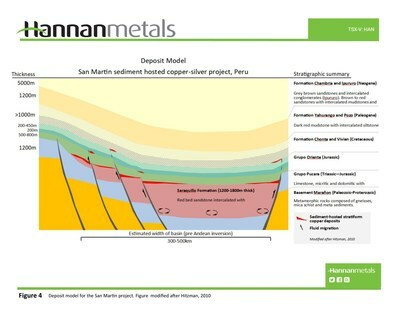 Management of Hannan have had significant prior experience in Peru, which is the world's second largest copper producer, with steady growth predicted over the coming years. The country's copper output is forecast to increase from 2.5 million tonnes ("Mt") in 2018 to 3.8Mt by 2027, averaging 4.7% annual growth. Sediment-hosted deposits are the world's second most important source of copper accounting for approximately 20% of world production. All samples were collected and bagged by Hannan staff. The samples were transported by bus to ALS facility in Lima where the samples were prepared by crushing the sample to 70% < 2mm, followed by riffle split and then pulverizing the split to 85% <75um. The samples were analyzed using the ME-MS61 technique which involves four acid digestion followed by ICP-MS. Over range samples for Ag and Cu were analyzed with method OG62. Hannan did not insert any certified standard into the batch, instead relied upon certified standards inserted by ALS. Table 1 – List of samples collected by Hannan during the field work 2018 (PSAD56/UTM zone 18S).